What Can You Do With This: Will It Hit The Corner? So here’s one where no one gets any credit for guessing the question. The question is obvious. The question is scattered throughout this entire clip (from the fourth season of The Office). I made the question explicit in the post title. Will the DVD icon ever ricochet into a corner? But what are the supplementary materials? How do you make this experience real to your students? What do they have in front of them? How are they getting their hands dirty with the math? It doesn’t matter if you don’t know how to make the supplementary materials. Just name them. This is a big-hearted community. We’ll find someone who does. BTW: Here is the high-res download, which Kate tracked down for us after I questioned her digital bonafides. There was an old mac in the back of my room at school that had our school logo moving around the screen in the same manner. My kids would cheer the same way when the logo hit a corner. I used to do a paper pool activity with my junior high kids years ago similar to something like THIS. It was a part of a larger “dot paper” geometry unit. The kids who cheered when the logo hit a corner played the paper pool game, and they got the connection to the logo. Although not the most popular game anymore, this is related to the old problems of playing pool (where to shoot on the bumper to sink it in the pocket). Requiring only a single bounce, that might be an easier question to begin this exploration. (as Steve mentions above). Similar, but a little more contemporary (?) would be one of those flash games that are link pong or breakout or something where the ball hits a paddle and bounces off. There are a million different versions of that and I’m sure there’s one that fits this concept (angle of incidence) fairly intuitively. Where should we position the paddle so that the ball hits the last brick on breakout or to get it through the hole on the other side? As you tend to like challenging extensions, once they get this concept down, you could ask what would happen if the TV was a different shape (circle, hexagon, etc.). Can we change the question a little? Since the show tells us the answer, the kids might not want to explore the question (most of my kids are Office addicts). What if I give the students a small sticker and challenge them to find a place on the screen to place the sticker so that the box will never touch the sticker. Can it be done? If so, where is the “magic spot”? I haven’t personally tried to work this out – I’m just thinking aloud. Maybe it would be too complex of a question for high schoolers… Maybe not. Totally bypassing the point, I’d wager to say that when I feel like I’ve had a particularly good class, about 10-20% of the time the reality is something more like this clip. Ok, so here’s where my brain goes with this, and then I’ll see if I can reverse-engineer it back to something 15 year olds will listen to. What is the algorithm for the movement? How many pixels does this thing move per frame? Where does it start? If it’s moving ten pixels at a time and we start it at (255,255) then we’re screwed. Or, wait, are we? Not really, since it could still effectively bounce off of both walls at once – not REALLY hitting the corner, but our eyes would be fooled into thinking it was. Geez, that is now messing with my head. Somewhere around here I’m wanting to model this in Geogebra and animate some junk, or write a quick Processing applet; something that tracks and highlights the bounce-points so that we can play with it experimentally, look for patterns, etc. The I-have-no-time-for-that scenario: pull out graph paper. I would’ve kept train-of-thought rambling but now I have to run out the door. But, yes, pull out graph paper and “animate” it. Look for those patterns. Awright, I’m cranky. A lot of good ideas here but where are the lesson plans? We’re all here in my garage getting high off the intrinsic connection between the world and math but few of you have done the heavy lifting of describing what questions you’ll ask students, when you’ll ask those questions, and what materials they’ll need to answer those questions. C’mon c’mon c’mon. Well, see, Dan, this is where it gets me. The questions should be based on your own classroom, so who can say what questions would work in my classroom (besides me)? And even I can’t predict what my own students will be able to come up with and dramatically change my own direction of questioning/leading. So, I enjoy making the connections to real life, but the “lesson plan” is up to the individual classroom on that individual day, right? Mathematically, to get the real answer, you’d need to know about vectors, angle of incidence, and a bit of geometry. So, how do you get the kids there? You could start with simple predictions of where the box (or billiard ball or whatever) will go next. Show a very short (like 1 second) part of the clip and ask them to think of that’s enough to predict its path. Maybe give them a sheet of paper with a short line-segment showing that path and the edge of the screen and ask them to draw as much of the path as they can. Ask the KIDS what tools they’d need (rulers? protractors? what else?) to do this. After their guesses are drawn, I’d ask what factors were important in their drawing. Speed of the box? Size of the box? Direction? Why is Jimmy’s drawing different than Cameron’s? Maybe have the class pick one to try and project that (via document camera?) on top of the screen with the box moving. See how close it matches. Why did/didn’t it? If you can, have the box leave a ghost trail behind it during this part of the clip to discuss further. From there, you maybe change some factors. A bigger box? Faster? Spinning box? Non-square? Different shape/size TV? Depending on your kids, you’d can make it somewhat challenging. Depending on the level of the kids, you could ask WHEN it would hit a certain spot or set of spots (eg one of the 4 corners). At any time kids ask if this is “useful” you have a million and two ways to tell them it does (light off a mirror, billiards, basketball, pong, shooting around a corner, etc.). i don’t think you need vectors. it has a constant speed up and then down, left and then right. there is no ‘bounce’ effect here, or angle of inflection etc, we’re thinking vertical velocity and horizontal velocity. i think this is more a problem of phases and shared factors, right? we need a speed to get from the bottom to top of the screen and one from the left to the right of the screen. How many times does the cube hit each side of the screen? What is the pattern of hits per side? Can we use the pattern to write a function? Can we use the function to predict after how many hits will the cube hit the corner? Does the color of the cube and if it hits the corner correlate? If so, can we write a function to predict the color of the cube when it hits the corner? place the 1×1 square so it CAN hit the corner first. define its location by its top left pixel, where will that have to be to hit the upper right? what if the bounce is 10 pixels off? 10 pixels off the other way? How will it bounce the second time? Ball’s on your side of the screen now – I’m awaiting your return. This is getting good. Really good. I still need to know, “what do your students have in front of them? what are they doing?” Otherwise, we have them watching you gesture at a screen in the front of the class. They have nothing to manipulate or play with. CalcDave, Well, see, Dan, this is where it gets me. The questions should be based on your own classroom, so who can say what questions would work in my classroom (besides me)? And even I can’t predict what my own students will be able to come up with and dramatically change my own direction of questioning/leading. So, I enjoy making the connections to real life, but the “lesson plan” is up to the individual classroom on that individual day, right? I’m all for letting this unfold organically, but class time is too scarce to leave this entire thing to chance. We need some kind of plan for your students — a series of questions, an activity — in case we need to prompt their imaginations. You and subsequent commenters are doing a great job abstracting the problem, outlining answers to the question, “What matters?” I’d like to point out that most of our textbooks short-circuit that process by explicitly labeling those points and data on either a picture of the problem or within the problem itself. This conversation would be valuable for students. It is interesting how the incoming path is parallel to the outgoing path. Hm, maybe it’s because this is what I’m currently teaching but I’m thinking graph paper or whiteboards with coordinate planes on them (whatever) and using slope and the equation of the lines. Maybe drawing the pattern they think the cube should take to reach the corner. Then we could give the slope of the line that it actually takes and they could adjust their equations. But somehow they need to be experimenting themselves and the math follows naturally. Like those little games where you shift them to roll the ball into the whole…except different. Maybe they could fold the edges of a piece of paper up to make a ‘screen’ but what could they use to roll around in it? A bead maybe? But technically it needs to be a cube. Hmm…can’t connect all the pieces here. One alternative view of this that I don’t think any of the other commenters have mentioned: with an alternative viewpoint, you can dispense with the bounce completely. Instead of looking at an object bouncing in a box, you can look at an object traveling in a straight line through several different perceptions of the box. You start with a 2-by-2 grid of copies of the box (or screen, or whatever), but only one of those copies is the “normal” box. The other three are horizontal reflections, vertical reflections, ad double reflections (which are 180-degree rotations). You might label the box with a nonsymmetric letter, like “R” to exhibit this, and then label the other boxes with the appropriate transformations of “R”. Then you tile the plane with this 2-by-2 system, and an object traveling in a straight line through this plane has a trajectory, from the point of view of the original boxes, which “bounces”. This approach could be part of a discussion on symmetry, or on alternative perspectives towards the same problem. I definitely wouldn’t expect the students to construct it themselves without an extraordinary amount of hinting, though. Yes, no, etc, let them guess. Hopefully at some point someone says that they can’t just look at a still picture – they need to see which way it’s moving. At this point in my magical ideal math class, everyone (or every group) has a computer in front of them with the Processing app I’ve just made (or Geogebra if I could script it to do what I’m about to describe, but I have my doubts). This app will take a starting position, and a movement vector, and then highlight every position where the moving box hits the edge. Probably marking the center point of the box, and possibly displaying a low-contrast grid representing the screen’s resolution and size (with some markers so we can quickly see exact co-ordinates for the marked positions … and maybe mouseovers to get the numbers directly if that were not a massive pain to code). After some playing around, they should find some things work and some don’t. See if they spot stuff going on with common multiples, divisibility. If no one else thinks of the tiling-the-screen-size trick that Jack Bishop mentioned, I’d totally do the reveal on that at the end after they’d figured stuff out some other way. Ha ha, that was going to be super terse when I started typing. I love that clip. I use it to introduce my Computer Science students to a language called Processing. We recreate the bouncing logo program, using our school’s mascot instead of a boring DVD thing. The source code (short and simple) is visible on the above page (just scroll down). An interesting extension: crank up the speed, then add some conditionals to the programs to keep stats on the average number of bounces required before hitting a corner. Students can shift the size of the rectangle to experiment and gather data on which angles work with which sizes of rectangle. I would’ve even just played with graph paper for the low-tech version, steering things towards the tiled-screen representation. Seems those two things are related but on opposite ends of the thought process – working out either gets you to the other end, but I don’t know if presenting both together would help. First, a link to a manipulative I just mocked up. The initial velocity and the size of the box can be changed. Hit ‘stop’ at the bottom of the screento reset. The slider controls the animation speed. I think something like this would be a good thing to put into kids’ hands. It’s just like drawing out paths on graph paper, but retains some of the dynamic of the original problem to it. I hope it helps you guys to think of other possibilities. I’m not sure I can articulate why, but I’m having mixed feelings about this WCYDWT. Part of my unease has been expressed in the fact that posters have been making suggestions about lesson plans and activities that are related to the idea of the video, but that aren’t based on the video or use it in a central way. Two things. First, it seems to me that we’d want our kids to be in the mental state of the characters in the video. I don’t know if using the video is the best way to make that happen. The situation in the video is a distant instance of a phenomenon that we could present more intimately. That is, the opening prompt could be a DVD screen saver–that’s what the students would encounter, rather than the Office folk watching the same thing. Maybe a ball bouncing around like on my applet above, without the grid and without the arrow? Second, I just want to say that if the actual clip is used and analyzed, more time is spent on digging the data out of screen shots and and building models, rather than exploring the mathematical structure that’s happening here. That is, there’s a trade-off: exploring more models and the questions they raise (more “pure math”y) versus creating the right model for a particular given situation (more “applied math”y). Both are super-important and fun. I just think there’s a balance there to be struck. 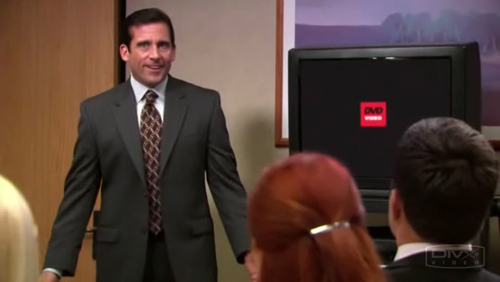 Thanks for the clip, I don’t watch The Office, but that was great. I’d keep the problem simple, and only offer a grid of basic dimensions for kids to use. Here’s my activity. I’d launch the class with the video. And, like Josh G’s “terse plan,” go the route of asking something on the order of where’s are any or all of the magical spots where a logo might start and never hit a corner. Kids would get this sheet. Basically with the question and a grid. And they’d probably draw all over it before they leave the grid and start to generate some sort of formulas and rules. I’d need to figure out those a little more before teaching this, but I wanted to put it up before I went home. Do you think this can work for fourth graders who have backgrounds with arrays and factors? My first thought in trying to answer the question focused on how I could simplify the problem, maybe try to solve an easier version. This is a strategy used for almost every math question and is something I focus on in all my classes, so I don’t mind *starting* with a still frame and some hand waving to get the brain going, but. I would quickly turn it over to small group discussion.s. Bring ’em back to share ideas, then let them try to answer the question with their favorite model (which not be their own). This approach is obviously not focussing on a particular field of math like vectors, and if that is tour interest, you would have to corral read in that direction. For me, though, each one of these open-ended questions is an opportunity to experience mathematical thought over any particular content criterion of a curriculum. This perspective also allows the question to be asked of nearly any age group. Pingback: think again! » Blog Archive » When will it hit the corner? Pingback: dy/dan » Blog Archive » Follow Up: Will It Hit The Corner? Pingback: Divide By Zero » Blog Archive » How To Teach: Will It Hit The Corner?